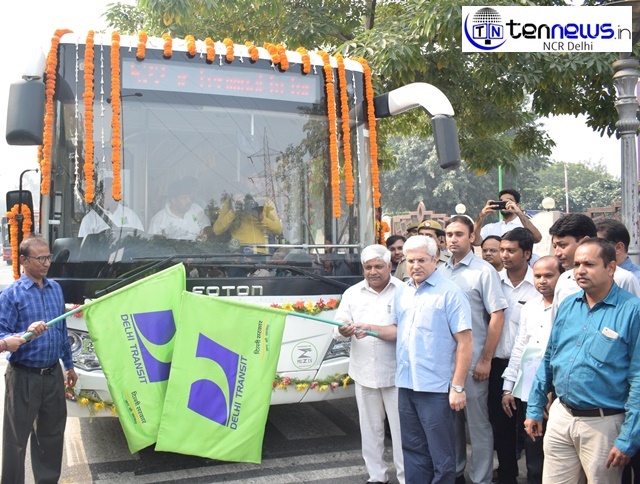 New Delhi: Transport Minister Kailash Gahlot inaugurated the first e-bus for the roads of the national capital, keeping the highly increasing levels of pollution in mind. This bus is provided by Mytrah Mobility Solutions. Mytrah Mobility is an end-to-end platform provider for enabling deployment of commercial electric vehicles. The platform provides a wide range of products and services across the industry value chain. The products and services include solutions for planning, customised manufacturing support, procurement, financing, operations and maintenance of fleets, charging infrastructure deployment and maintenance. Transport Minister kept this e-bus for a trial period of 3 months in which one bus will be running on route 522 i.e from Ambedkar Nagar to Krishi Kunj. This bus is an innovation of two brands in collaboration, which are PMI & FOTON. PMI Electro Mobility Solutions Private Limited is a subsidiary of PMI Coaches Private Limited, incorporated in June 2015. The company aspires to be a ‘Zero Emission’ mobility solution provider. A company is planning to target the Commercial Vehicle segment and intends to launch a whole range of Buses (12m, 9m & 6.5m) and trucks & loaders, starting from mini trucks and light commercial vehicle to go up the value chain. “This step taken by the Transport Authority is something that should have been done a bit earlier, but as it’s said ‘better late than never’, Delhi’s pollution is challenging every citizen and this measure is a must.